In this week’s episode Pat McCabe speaks with Joanna about: we need a radical course-correction; the oppression of Native American culture; we were born in Beauty; big changes coming in our current lifestyle; healing shame, opening to grace; we are in a time of pure potential; carrried by the Spirit of Life into a place of visioning; learning to trust the Spirit and the Earth community; from desdpair to surrender; inquiring what we can do in these times; calling upon the wisdom of water; the Human Reunion Ceremonies; the witch hunts as the archetypal wounding of humanity and the healing power of indigenous lineages; the vibration of Truth; re-telling the old stories to change the future; ending the decption of the war between men’s nations and women’s nation; re-membering and giving language to the sacred masculine. Pat McCabe (Weyakpa Najin Win, Woman Stands Shining) is a Diné (Navajo) mother, grandmother, activist, artist. writer. ceremonial leader, and international speaker. She is a voice for global peace, and her paintings are created as tools for individual, earth and global healing. 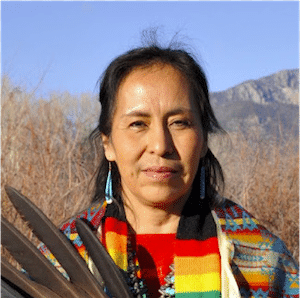 She draws upon the Indigenous sciences of Thriving Life to reframe questions about sustainability and balance, and she is devoted to supporting the next generations, Women’s Nation and Men’s Nation, in being functional members of the “Hoop of Life” and upholding the honor of being human.